We all love a juicy piece of gossip now and then. Even if we do not want to believe it, we still want to hear it. Unfortunately, those few who take delight in spreading rumors do not seem to realize that doing so may harm innocent people. Here is a real life story of what can happen. A foreign-born research scientist who had just accepted a position in a testing laboratory at a major U. S. university resigned after only a week on the job because he heard a rumor that his predecessor had been “canned” for speaking with a foreign accent. His coworkers jokingly told him that he would probably be “canned” soon also because he sounded “funny” when he talked. Even though he spoke English extremely well and had won accolades for his conference presentations, he did not understand the colloquial term “canned.” When the meaning was explained to him sarcastically, he immediately resigned rather than face the potential disgrace of being fired. He became the latest in a string of internationally renowned scientists who had quit the lab because of this ill-founded rumor. Regardless of how well you communicate; inaccurate information will still wend its way between and among departments and spread throughout the entire organization if left unchecked. Misinformation can be hurtful to sensitive people, detrimental to the spirit of teamwork, and waste time, energy, and other precious resources. Do not wait until you have all the details—just get the truth, as you understand it, out there quickly. Unless you are bound by some legal restriction, when you get wind of a rumor tell the Doers in your charge everything you know about the facts of the matter. If some of what you say later turns out to be inaccurate, then retell it the right way as soon as you get a chance. You may have to do this several times before a rumor dies and the truth wills out. 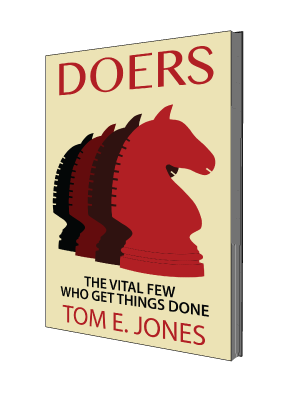 Pick out the Doers among your followers and talk to them personally. Tell them you want to know the truth about what they are hearing. Ask them not to embellish upon what they tell you. Let them know that if you find out they have twisted the story even a little bit, you will not rely on them again. Listen to individual opinions of the Doers thoughtfully without comment. Keep your attitude and personal feelings to yourself. Avoid statements about the right or wrong of what is happening. Report only the facts you know first hand. This may sound harsh, but people do not care what you think, nor do they want your opinion. They just want to know what you know. The rumor mill usually carries harmless or amusing commentary. Sadly, some people like to share unfounded gossip or false stories just to see how others respond and react. That is why it is so important to engage the Doers in controlling rumors.